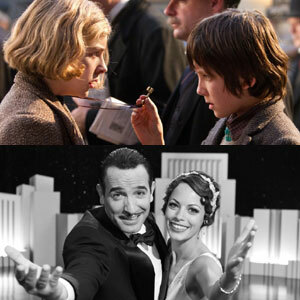 Hugo, starring Chloe Grace Moretz and Asa Butterfield (top), and The Artist, starring Jean Dujardin and Berenice Bejo (below), are nominated for Best Picture in the 84th Oscar Awards. Martin Scorsese’s fantasy movie, Hugo, scored the most number of nominations in the 84th Oscar Awards with 11 nods, including Best Picture and Best Director. Meanwhile, the silent-movie drama, The Artist, got 10 nominations; including Best Picture, Best Director and Best Original Screenplay (Michel Hazanavicius), Best Actor (Jean Dujardin), and Best Supporting Actress (Bérénice Bejo). Other Best Picture nominees are The Descendants, Extremely Loud & Incredibly Close, The Help, Midnight in Paris, Moneyball, The Tree of Life, and War Horse. Best Director nominees Scorsese and Hazanavicius will be competing against Alexander Payne (The Descendants), Woody Allen (Midnight in Paris), and Terrence Malick (The Tree of Life). Hollywood A-list stars George Clooney of The Descendants and Brad Pitt of Moneyball, plus Gary Oldman of Tinker Tailor Soldier Spy, are up against Frenchman Jean Dujardin (The Artist) and Mexican Demián Bichir (A Better Life) in the Best Actor category. Clooney previously won Best Supporting Actor for Syriana, while this is Pitt’s fourth Oscar nomination. Oldman and Bichir are surprise nominees in this category, taking the spots of early favorites Leonardo DiCaprio for J.Edgar and Michael Fassbender for Shame. Meryl Streep scored her 17th Oscar nomination for her performance as former British Prime Minister Margaret Thatcher in The Iron Lady. She will be competing in the Best Actress category alongside former nominees Glenn Close (Albert Nobbs), Viola Davis (The Help), and Michelle Williams (My Week With Marilyn). They will be joined by first-time nominee Rooney Mara of The Girl With the Dragon Tattoo. Streep is gunning for her third Oscar win.